Many people tend to equate snow sports with sustaining injuries which can ruin a holiday, especially those who are beginners or novices. However, whilst most people are familiar with seeing some of the injuries which can be sustained on the likes of TV programmes or are aware of them through reading the details of insurance policies, the facts are that far more people come back from a snow sports holiday unscathed than those who sustain injury. Of course, snow sports can be dangerous which is one of the reasons why they are so thrilling to so many winter sports enthusiasts. However, whilst you cannot guarantee you won’t suffer an injury, there are plenty of things you can do to minimise the risks. 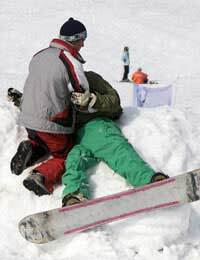 Most snow sports injuries are sustained by beginners or novices who fail to obtain proper professional tuition. Because of that, they learn bad habits and fail to recognise dangerous situations which then lead to injury. Therefore, make sure that you not only get instruction to suit your ability but that you follow any advice that you are given by your instructor. And remember, you’re there to learn and not to try to impress your instructor or the rest of your party so don’t run before you can walk. In fact, this is one of the major causes of injury, especially for beginners who feel as though they’re missing out by having lessons for the vast majority of what’s supposed to be an ‘adventure’ holiday. Ultimately, the skills and tips you learn early on will serve you well on many more snow sports holidays to come. If you’re just starting out, it’s likely that you’ll be renting most, if not all, of your equipment. Therefore, don’t overestimate your level of skill. For example, longer skis are far more difficult to turn and if ski bindings are set too high for your competency level, then you’re putting yourself at far more risk of injury. Make sure your footwear feels right. Be honest when asked to assess your own competency. Boots should fit snugly but should not allow your ankle to turn. In fact, companies in resorts should ask you a lot of questions before hiring out equipment. Things like your height, weight as well as your ability should be ascertained to ensure you hire the most suitable equipment. Once you have put your boots on and have gathered up all the rest of your equipment, including things like gloves, wrist guards and helmet, ask one of the staff or a more experienced member of your party to ensure that it’s all fitting correctly. Above all else, NEVER borrow any kit from your friends as this dramatically increases the risk of injury. Snow sports can exert extreme pressure on your muscles and joints so, just as you would do with any other sport, warm up and warm down properly with a few gentle stretching exercises, paying particular attention to your hamstrings, calf and thigh muscles as well as your hips. Stretching and holding each major muscle group gently for 30 seconds or so won’t take too long and it’s a well known fact that more snow sports injuries are sustained through people’s over-eagerness to hit the slopes before they’ve warmed up sufficiently. Another major cause of injuries occurs where people do not want to accept that they might not have the same level of ability as other friends or family members who are travelling with them. This goes for more experienced people too. Therefore, they’ll often sustain injuries by carrying out manoeuvres which they’ve yet to perfect or will take on courses or runs designed for more advanced participants in their chosen snow sport. So, you should always keep within your limits and abilities until you feel confident about moving on to the next stage. And, even if that means that you spend most of the daytime kept apart from your companions in other groups at a similar level to you, you’ll still have time to join your friends for the après-ski which has got to better than being flown home with a serious injury because you took on more than you were capable of.